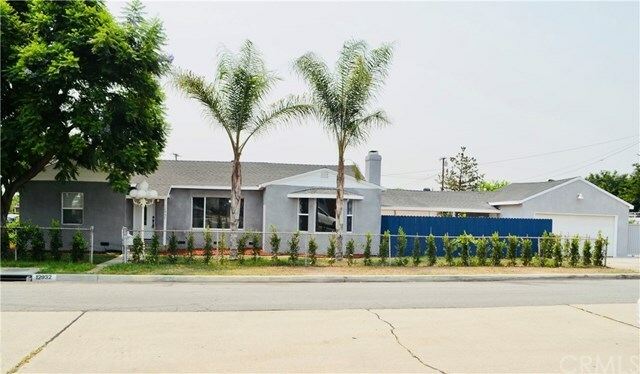 Beautifully remodeled home on a large corner lot. Property has been remodeled, with new floors, windows, fixtures, cabinets, quartz counters, kitchen, bathrooms, recessed lighting throughout, ceiling fans and interior and exterior paint. Seller cut no corners on this one, includes brand new stainless steel refrigerator, gas range, vent hood and dish washer. Open floor plan concept with fire place in living room, great size dinning area off of the kitchen with plenty of counter top area for a few bench stools. Property is fully fenced with a covered patio perfect for entertaining, RV/Boat open parking and a 2 car detached garage with laundry hookups inside. This property wont last!!! Directions: North of Mulberry Dr, South of Lambert Rd, on the Corner of Greenleaf Ave and Dunton DR.